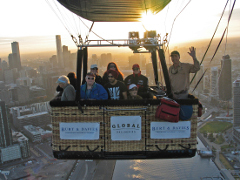 Australia's first Easy Access Basket (EAB) was launched by Global Ballooning Australia in 2012. 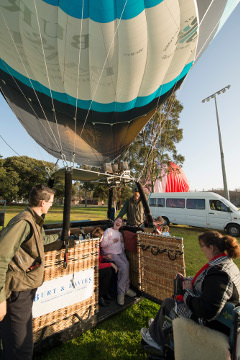 The basket enables passengers with physical mobility impairments to experience the joy of a hot air balloon flight along with their family and friends. Unlike traditional balloon baskets that require passengers to climb in and out over the edge, the innovative EAB incorporates a door to allow less able-bodied individuals, including those with serious physical disabilities, to enter and exit the basket with ease. The EAB also incorporates customised seating, harness and a grab handle suspended from the burner frame. It hasn’t always been smooth flying for GBA's Director, Kiff. In January 2010, Kiff was in a near-fatal motorbike accident. He woke up in the Royal Melbourne Hospital and with life threatening injuries began a yearlong recover process. As he entered the long road of rehabilitation, having to learn to walk again, he feared that he might never again return to being a commercial balloon pilot. Whilst in rehab, Kiff met specialist injury lawyers, Peter Burt and Clara Davies, who began acting for him in his TAC claim. Having never previously acted for a balloon pilot, Burt and Davies embarked on research into a day in the life of a hot air balloonist. This involved them experiencing an early morning flight over Melbourne and subsequent discussions about what was involved. During his journey back to health, many discussions were had and a bond was formed. 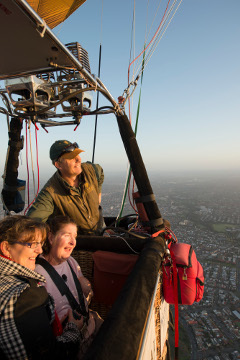 This led to Kiff's epiphany to build Australia’s first Easy Access Basket, allowing those with disabilities to experience a lighter than air balloon flight over Melbourne and to improve quality of life in the process. Global Ballooning Australia & Burt and Davies jointly funded the design and production of Australia's first commercial disabled passenger balloon. It is an innovative and altruistic joint venture intended to provide happiness to those who would otherwise be denied. This project required a first of its type balloon basket to be designed and constructed by an Australian balloon manufacturer and certified airworthy by the Civil Aviation Safety Authority (CASA). Global Ballooning Australia amended its operating procedures after making a successful safety case to CASA and thereby obtaining an exemption against the regulations prohibiting the flight of handicapped persons in commercial hot air balloon operations. Please make sure you read, sign and send back the below terms and conditions document upon booking. Click here for details on our Melbourne flight.